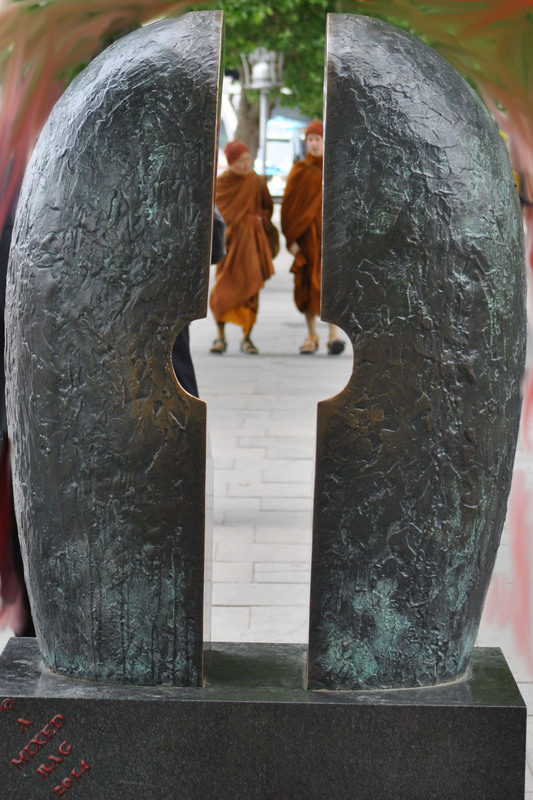 When Nia spotted my last post, she noticed that there were what appeared to be a pair of monks in the centre of the sculpture. I waited until a couple of people had moved away from the centre, but never noticed the monks until we walked further along, and I didn’t see them in the photo. Nia suggested I crop the photo, so here is the new version. I have blurred out the edges so the people at the sides are not the focus. This entry was posted in Photography and tagged Days Out, Family, Inspiration, Inspirational, June, Landmarks, Life, Nikon, Nikon D3000, Photos. Bookmark the permalink. Excellent! This is very suggestive editing! I’m happy Nina pointed it out to you and you jumped at the opportunity of making this wonderful photo! Thanks Bastet. As soon as she mentioned it, I saw it. And I’m happy you did. This would be terrific for the weekly wordpress photo challenge. The theme this week: Between. This fits that challenge perfectly, and it’s just generally a great shot. I thought perhaps you had planned that shot when I first looked at it. It focuses more on the monks cropped like this! It does. It’s why I blurred the edges too as it had the heads of people at the sides. well that is just cool. Sometimes I am amazed at what I see in my photos that I wasn’t trying to get a shot of. Seems this happened to you also. This is pretty cool! It did. I never noticed until Nia spotted it. I have also used this for a for a quote next week.